After driving across Australia, USA and backpacking in Asia for the last six months, I can say without a doubt that the most beautiful place I’ve seen so far has been the Rocky Mountains in Western Canada. 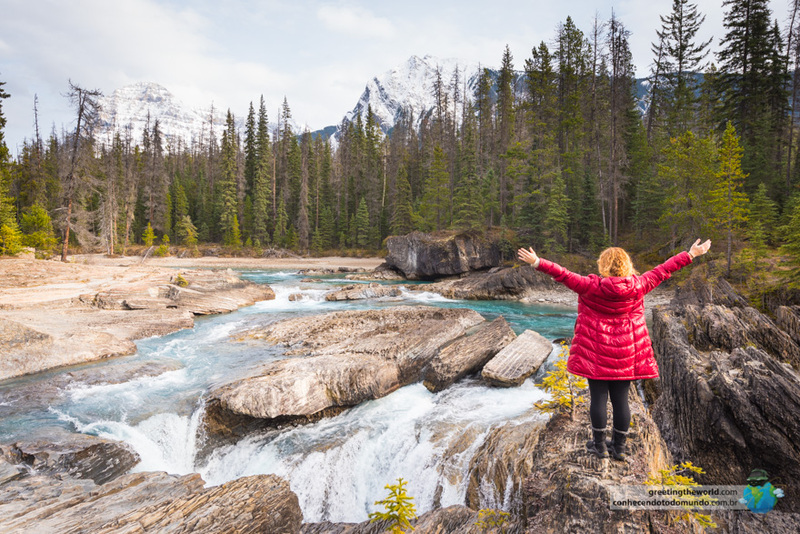 We spent three weeks greedily taking in the wild beauty of Whistler, Jasper and Banff National Parks and enjoying everything these magical places had to offer. From impressively large wildlife everywhere we looked, rugged snow capped mountains and piercingly blue lakes that reflect the scenery as perfectly as a clean mirror, the Rockies utterly blew our minds! Here are the highlights of our trip and the reasons we now wonder if anything else can live up to our awesome experience of the Rockies. Uhoh! 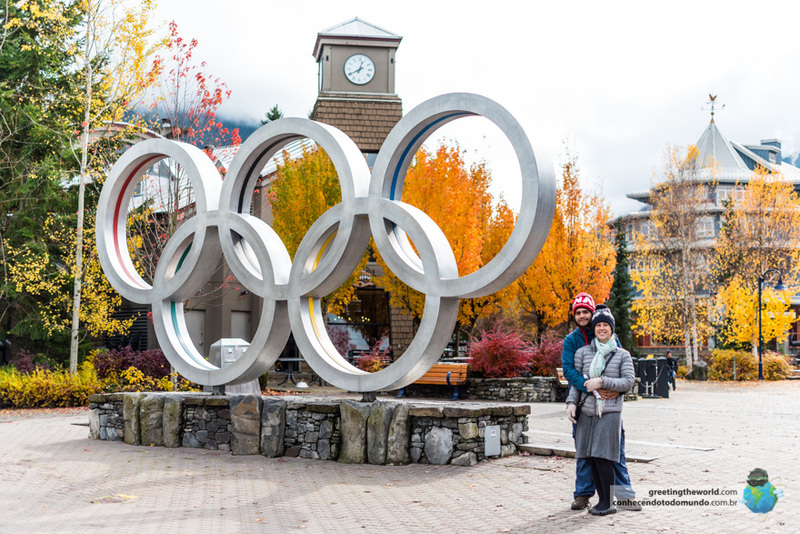 Although not part of the Rockies themselves, we stopped at Whister ski village en-route to experience its charm and beauty (made even more famous when the 2010 Winter Olympics were held there). We arrived in autumn when there still wasn’t enough snow on the slopes to try our luck at skiing, but we enjoyed walking around the quaint town centre, admiring the autumnal foliage on the trees and the natural stone architecture. We enjoyed a hearty lunch here (juicy burger served with crunchy fries and a large bowl of pesto penne for under $10 for both of us) before spending the afternoon trekking in the nature around Whistler. 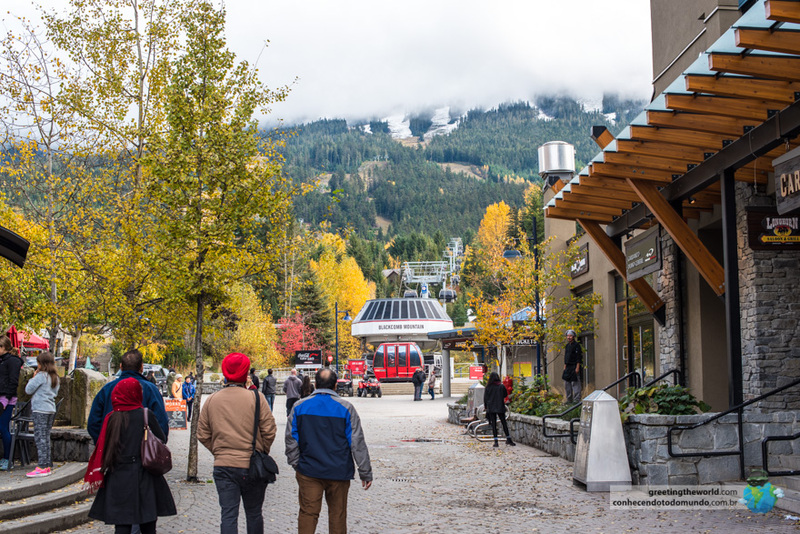 There are many hiking trails, waterfalls and lakes to explore in the Whistler vicinity if you’re there in the warmer months, otherwise shredding up the powder at one of Western Canadas best ski slopes is a must if you’re there in Winter. Everywhere we went on our way to and through the Rocky Mountains, we were blown away at the fresh, pristine and colourful beauty of the scenery we passed. 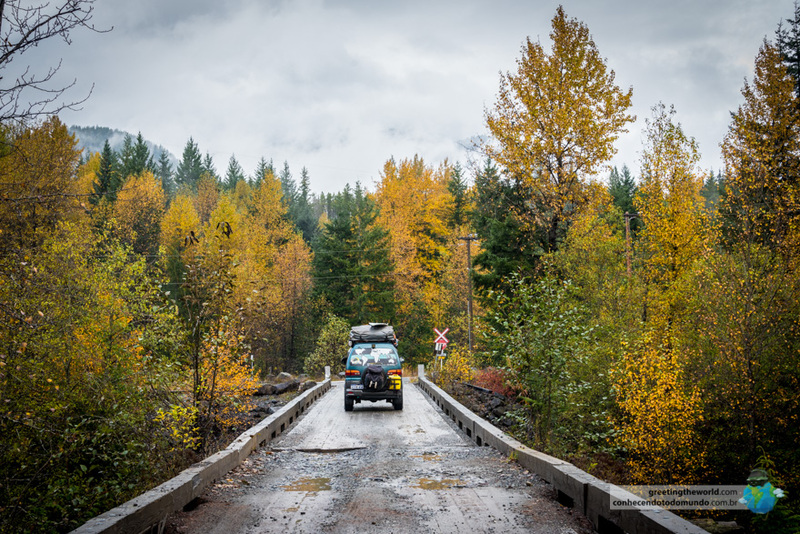 Alex and I are not used to experiencing a ‘true’ autumn/fall as we come from tropical and desert climates, so seeing the contrast of crimson, golden and orange leaves surrounded by mountains, lakes and waterfalls made our jaws drop. We spent many moments pulling the car over on the side of the road to jump out and appreciate the stunning scenery that sat right by the highway – imagine how beautiful it must be when you go further off the beaten track! The salmon run of British Columbia is a magnificent natural spectacle – salmon of up to 5 feet swim continuously for over 17 days and nights to reach the same, calm place they were born in order to spawn. The event happens every autumn – check out the best spots to witness this phenomenon here. 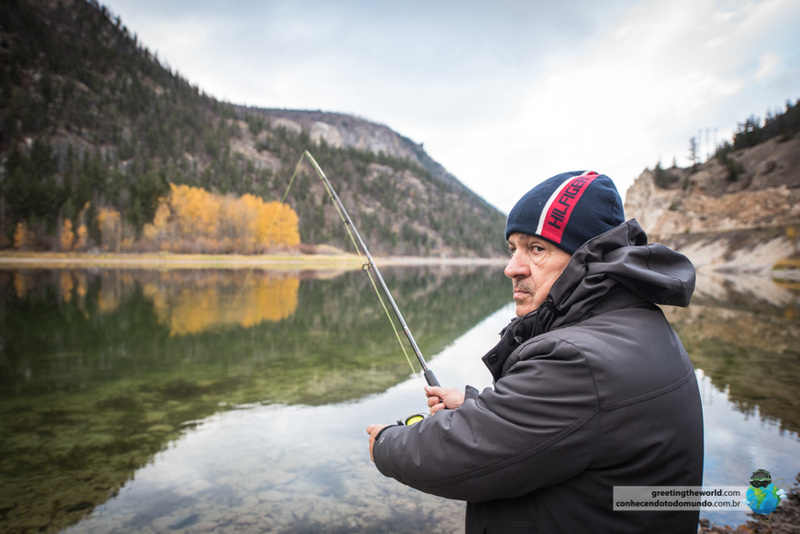 Although we didn’t get to experience the salmon run ( we arrived later in the season) we enjoyed casting out for a nibble at many of the lakes and rivers we came across. Before you fish in the area make sure you check fishing regulations and licenses. A photo says a thousand words, so I won’t need to explain myself much here. 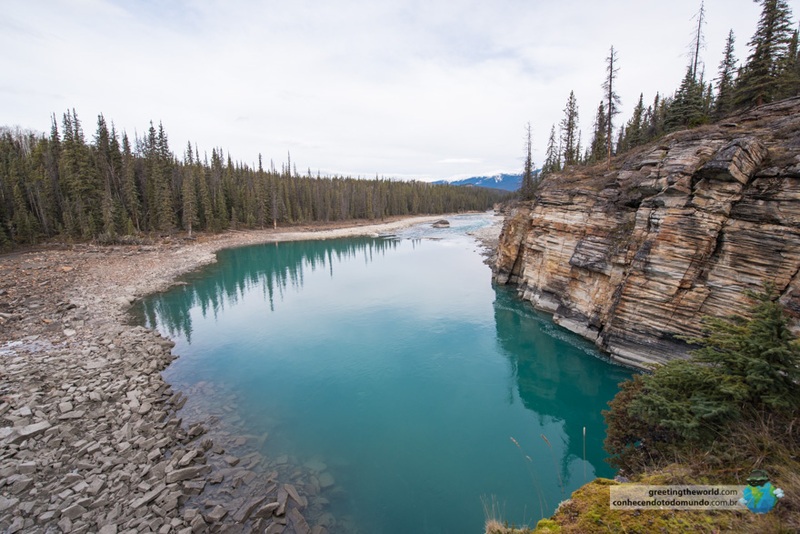 We spent three and a half days exploring the lakes, canyons, forests, hot springs, glaciers and rivers of Jasper National Park and each day our amazement was doubled at the incredible scenery around us. Must visits are Medicine Lake, Maligne Canyon, Miette Hotsprings and the Athabasca Falls and piercingly blue lake by its side. At the Columbia Icefield you can visit the museum or take a 90 minute hike onto the Athabasca Glacier itself. The drive to some of these places is just as beautiful as the destination itself, so make sure you take time to enjoy the view en-route! Coming from Australia I’ve never experienced the classical European/North American array of animals we see in mainstream films and fairytales. When I started seeing deer, squirrels and even a bear everywhere I looked I honestly felt like I was in one of my childhood storybooks or a character in a Disney movie! We saw caribou, horned mountain goats and even a wolf all right by the road side and in large quantities. The animals seem larger than life and really add to the feeling of being in the wilderness where nature is king. Take care while driving and avoid roads at night time as these animals can do some serious damage to your car and – god forbid – life. We were lucky enough to see a real life Grizzly Bear right at the end of autumn. Normally these guys have already started hibernation by this time, but some are still chasing their last calorie-filled meal of the year. 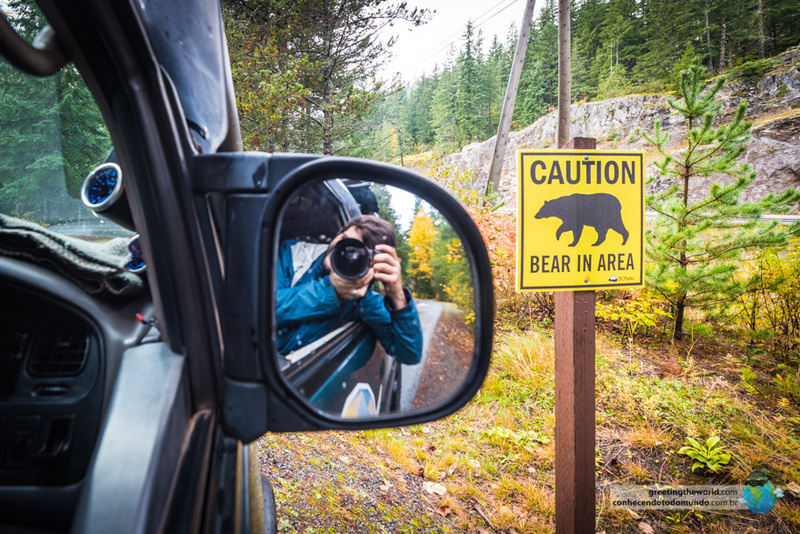 This one stopped the traffic on the Icefields Parkway and crossed the road in front of us! The vast area north-east of Vancouver and through the Rocky Mountains is dotted everywhere with camp grounds and wild camping opportunities. Although the weather was getting chilly we enjoyed a few nights camped by rivers and beside mountains in the wild. Some campgrounds are closed during winter, while others are open year round and offer drop toilets, bear-proof bins and fire pits. Banff National Park is connected to Jasper National Park by the Icefields Parkway, arguably the world’s most picturesque road. After driving over 25,000kms on our journey so far I’m still searching to find a more beautiful road. The two parks meet at the Athabasca Glacier and Icefield (picture above) and as you head further south into Banff National Park the scenery is dotted with hundreds of turquoise lakes. 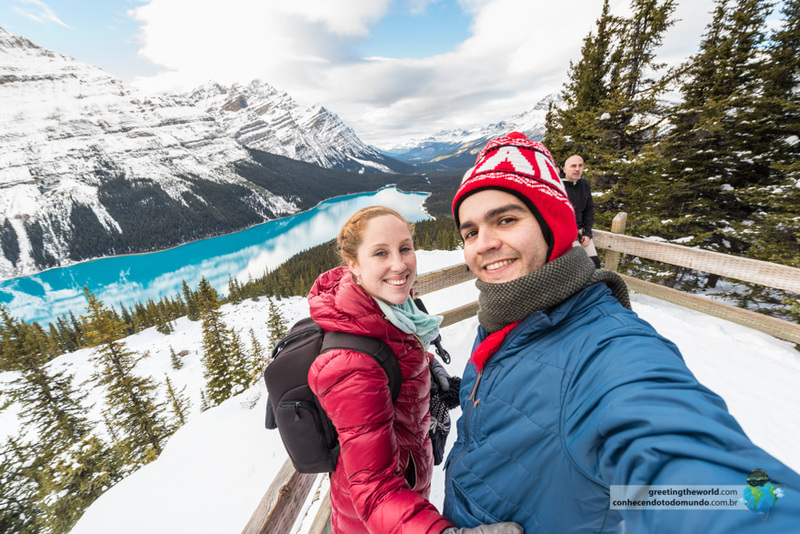 Must visit attractions of Banff National Park include Peyto Lake (Canada’s bluest lake), Johnston Canyon, Lake Louise (see below) and Banff Village itself. Be aware that some natural attractions close in the later months of Autumn due to weather. If the photo above hasn’t yet sold you, then check out the three photos below. Lake Louise lies high in the Rocky Mountains and was the main attraction along the Canadian Pacific Railway when it was built in the late 1800s. Activities in the area include hiking, mountain biking, canoeing, open air ice skating in the winter and skiing at the nearby Lake Louise Ski Resort. Or you could just chill out and enjoy a fancy high tea overlooking the lake from the Chateau Lake Louise Hotel. Sounds pretty good to me. 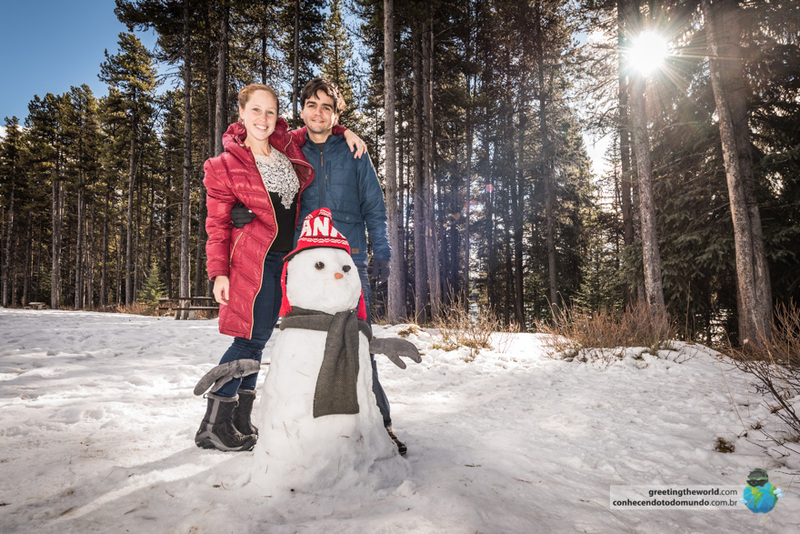 If you’re driving south like we did, Banff village will be your last taste of the Rocky Mountains before you hit Calgary. The charming town is overlooked by the impressive Mount Rundle and, even here in the town centre, you’ll more than likely see a deer or two walking down the sidewalks! Apart from the local boutiques, souvenir shops and never-ending restaurants you’ll find a whole lot of other interesting things to do in this cute little village. 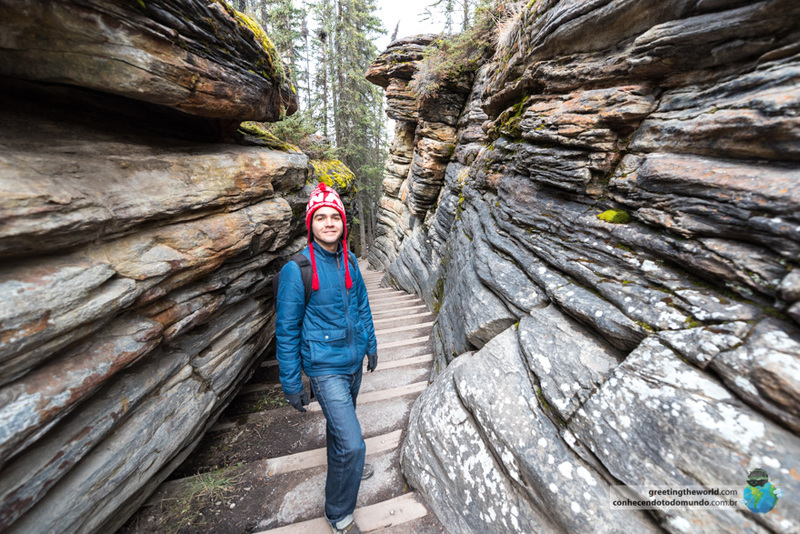 Our favourite activities included visiting the Upper Banff Hot Springs and browsing through the historic Banff Park Museum where you’ll learn more about the National Park and the impresive animals that call Banff home. Check out the Banff Gondola Ride to see the town in relaxed comfort from the top of Sulphur Mountain. The Rocky Mountains utterly blew us away. Although we visited in late Autumn, this magnificent mountain range, its lakes, glaciers, forests, hot springs and canyons can be enjoyed year round with skiing and ice-skating in winter, wildflower hunting in spring and hiking during summer. I honestly don’t know how, or if, we’ll ever be able to top the time we spent in the Rockies – what more could you want from a holiday? We are a Brazilian engineer, Australian videographer and Japanese van attempting to drive around the entire world. 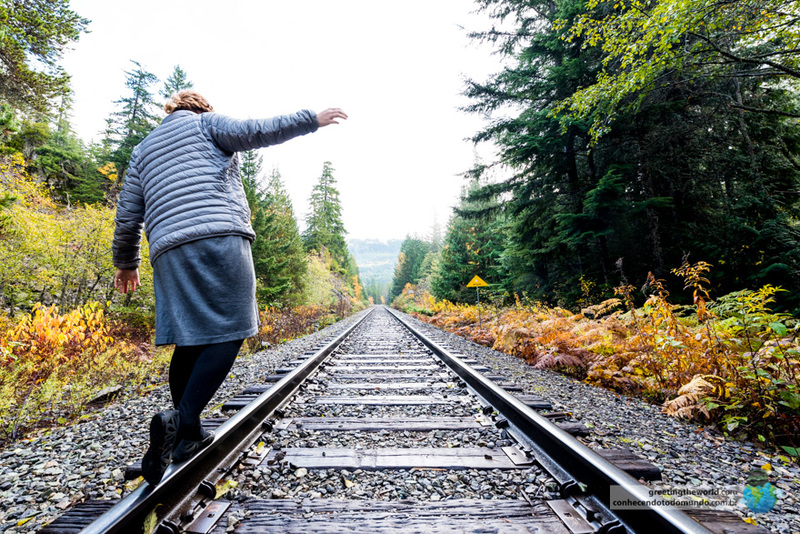 Come along on the journey of a lifetime with us!